The information presented on this page was originally released on August 15, 2014. It may not be outdated, but please search our site for more current information. If you plan to quote or reference this information in a publication, please check with the Extension specialist or author before proceeding. 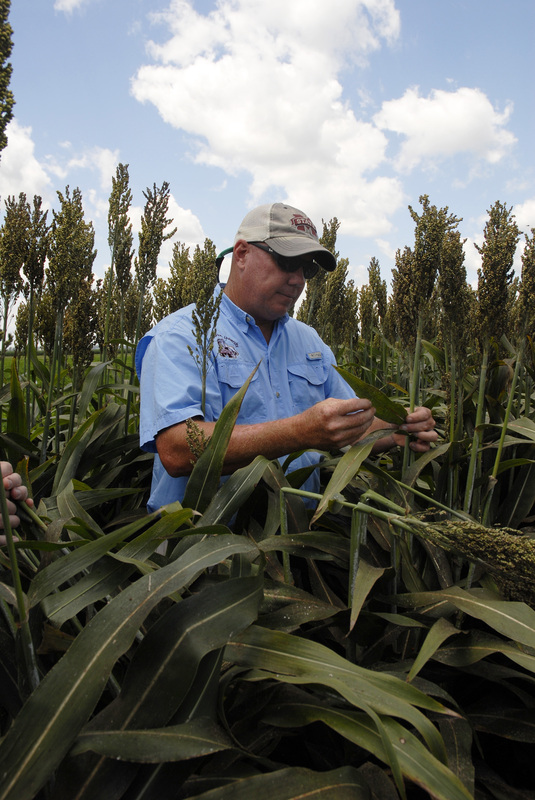 MISSISSIPPI STATE -- Crops almost never go from potentially record yields one year to drastic acre reductions the next, but catastrophic aphid infestations coupled with low prices may force grain sorghum growers into that situation. 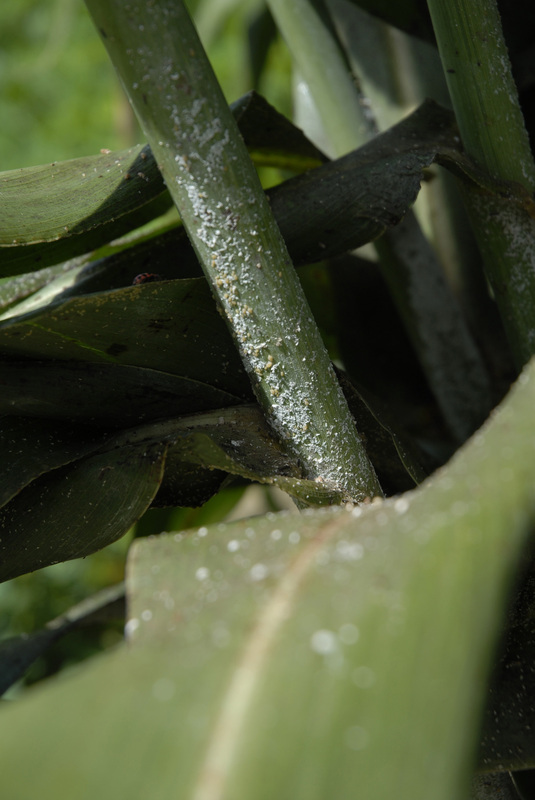 Erick Larson, grain crops specialist with the Mississippi State University Extension Service, said if not for the white sugarcane aphid, the state would have one of the largest grain sorghum crops in recent history. Larson said growers will likely consider a recurrence of aphids too risky next year to attempt growing much, if any, grain sorghum, which is already a relatively minor crop in the state. The Mississippi Agricultural Statistics Service recently reported 85,000 acres of grain sorghum for harvest, up 23,000 acres from 2013. Based on Aug. 1 conditions, yield is expected to average a record 96 bushels per acre, up 2 bushels from 2013. The statistics service forecast a total of 8.16 million bushels, up 40 percent from a year ago. 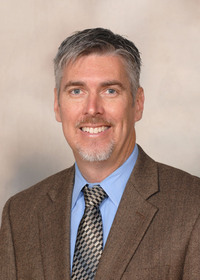 MSU Extension agricultural economist Brian Williams said prices have trended down since the national crop is growing so well. Grain sorghum in Mississippi is selling for $3.94 a bushel, compared to one year ago when it was closer to $4.52 per bushel.  Jeff Gore, an entomologist at the MSU Delta Research and Extension Center, said only one chemical has had any success controlling these new pests, and that control is still limited. The Environmental Protection Agency granted growers an emergency exemption for two applications of Transform, which has been used in the past to control aphids in other crops. As the problem has persisted, EPA recently amended the exemption to allow a third treatment, not to exceed 3 ounces per acre this year. Gore, who works through the Extension Service and Mississippi Agricultural and Forestry Experiment Station, said a huge research effort is underway this year. The concerns are not only about yield losses, but also harvest complications caused by sticky secretions from the aphids that can cause major mechanical problems in combines. “We have seen that rain does not reduce aphid numbers but helps wash honey dew off plants temporarily,” he said. Extension entomologist Angus Catchot said Transform appears to be the only viable control option at this time, but it only provides seven to 14 days of protection. “Applications are a challenge because the sprays need to reach the lower canopy to be most effective,” he said. “Most fields will need a second and possibly third application when re-infestations occur. Catchot said growers will not achieve 100 percent control because of coverage challenges in most fields. Catchot said numerous beneficial insects, such as ladybugs and syrphid fly larvae, will feast on the aphids, but, populations eventually explode and beneficial insects cannot keep up. Catchot said Transform can knock the pests back, but the end result is an increase in production costs as growers must make several applications during the season. This cost is something will have to factored into a growers budget in coming years. The aphids were discovered in 1896 in Hawaii and arrived in the continental United States in 1977. They were detected in Louisiana in 1999 but only on sugarcane. Late last year, they made a host shift to grain sorghum and were detected in Louisiana, Texas, Oklahoma and Bolivar County, Mississippi. Contacts: Dr. Erick J. Larson, Dr. Jeffrey Gore, Dr. Angus L. Catchot, Jr.